A Septimus Hungerford lived in Australia for ninety-nine years after being born in Ireland in 1825 to Emanuel and Catherine (nee Loane) and is one of the outstanding rectors associated with the historic church of St Thomas at Enfield. With the opening up of tracks to Parramatta and Liverpool (Cowpastures at Camden) coaches started operations in the mid 1820s when a Mr Ireland gained the contract for the Sydney-Liverpool run. By 1840 Mr Ireland had the mail contract to Goulburn using the Bark Huts at Enfield as a staging post. The Faithfull Farm and an estate owned by Mr Wilshire became the setting for the village of Enfield named after the market town near London, where the activity revolved around timber-getting, then farming, market gardens and an orchard was established by Hilly on the Cooks River at the foot of the present Burwood Road. It was in this setting that the influential Thomas Hyndes built St Thomas Church in Coronation Parade to a design by John Frederick Hilly. It consists of a sanctuary, chancel, nave and vestry, surmounted by a spire on a square Norman tower. Distinctive adornments added to the interior near the turn of the century were scriptural verses over chancel arch, and nave walls. which Governor Macquarie would not recognise, went to the South Coast and milled cedar successfully and returned to Enfield in 1823. He also acquired extensive grants of land in the area now known as Wahroonga and Turramurra. He built his country home on Punchbowl Road in 1842 which was called Adelaide Park and in 1847 he donated five acres of his property to the Bishop of Sydney to build a church. A hall was initially built by Thomas Hyndes in which regular services were held until the completion of the proper church in lS4, the foundation stone was laid on the let. February of that year, it was opened for worship on the 9th January 1849 and consecrated on the 31st. December of that year. 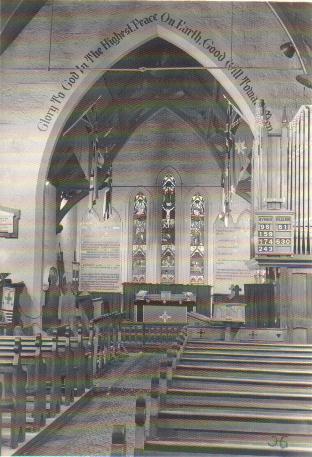 The pipe organ was installed in 1909 and the lychgate dedicated in 1921. A Memorial Tablet to the memory of Thomas Hyndes who died in 1855 is inscribed “To the memory of Thomas Hyndes who died 18th. February 1855. If you will seek his memorial — Look Around”. The original building made of roughly dressed sandstone is typical of an English village church. Surrounding the church is a cemetery containing 3,500 grave sites. In 1849 when the church was open for worship, the hall was used for a denominational school and flourished until 1895. In 1923 the front section of the original hail was demolished and a new Parish Hall was built with a second storey over the old rear section containing kitchen and meeting rooms. Memorial windows are an interesting aspect of St. Thomas. The main eastern windows depict the Last Supper below the Crucifixion in the central panel, Moses and the Laws are on one side and the disciples including Thomas on the other side. St Thomas was firstly part of the St. John’s Ashfield district and was declared a separate parish in 1868. The Rev F Wilkinson, Rector of Ashfield at the time, caned the wooden figureheads which look down from the walls of the church. The church in those early days was lit by candles, the seating consisted of forms and the inside walls were roughly finished as it had been intended to plaster them. In 1939, the worn out shingled roof was replaced by the present attractive slate roof that blends so well with the stone walls of the church. A system of electric bell chimes in the tower was installed as a memorial to the men of the parish who fell in WW2. A Wall of Remembrance was built near the church and links the past with the present by providing a newer method of disposal of the body by cremation. Amusing readings in the records tell of a Rainbow Fete in 1928 when 6d, coupons were sold, redeemable for a like amount at the fetes. Another item for the year 1897-8 is for payment of £2.12. 0 at the rate of 1/— per week for blowing the church organ! Measures taken to combat the devastating Pneumonic Influenza Plague which swept the world in 1918-9 are entries in the Service Book for Sundays 2nd and 9th February 1919, showing that by order of the authorities, services were not permitted in the church on those dates. This church is a fine example of the faith of humble servants of God who have continued to preach now for almost a century and a half. We are deeply indebted to the Rev. Graham Harrison for making available the records of St Thomas Anglican Church at Enfield. Written by Lucy Stone (1994). The list of persons interred in St Thomas’s Enfield Cemetery is listed in the book St Thomas’ Enfield: A matter of grave importance published 1999 by Sally Jackson and researched by Barbara Neville. My name is Lee magnussen and I have numerous relatives buried at the Saint Thomas’s Cemetry. I have been trying to contact Barbara Neville for a number of weeks and have had no contact with. I was given her contact phone number which has a message requirement which seems not be working. Is there a possibility of contacting her and informing her that her contact message is not working. My contact mobile phone number is 0427596650. I hope I can contact her regarding the plot numbers for relatives. I have a convict ancestor who was married at St Thomas church. The notes I have say Irishtown, Enfield. Is that correct? Was Irishtown a part of Enfield, or just the church. Irishtown was a former name of Bankstown, which is a few kilometers west of Enfield. I believe that my great great grandparents are buried at St Thomas Cemetery. Their names are Robert John Pilgrim and Isabella Jane Pilgrim. I haven’t been there before. Am I able to just turn up and look for them? If I can is there some sort of guide where they could be? In the book about this cemetery are they mentioned in this book. According to the book ‘A matter of grave importance’ by Sally Louisa Jackson, Robert and Isabella Pilgrim are buried at St Thomas Church. Robert died on 26/3/1932 and is buried in Grave 9B, Section G. Isabella died on 27/3/1944 and is buried in Grave 14, Section G.
You may wish to contact the Church directly to enquire when the grounds are open. St Thomas is listed and there is a photo of one Pilgrim grave. My great grandfather Thomas Foster is buried at St Thomas Church. Could you tell me when he was buried there. Thomas Foster is listed with the following details: Died 10/2/1916 at age of 64, buried Section D Grave 21. Son of Stephen Kelcey & Elizabeth Knott, Lyminge, Kent, Eng. Baptised 18th Oct. 1789, Lyminge Kent. Eng. Married Frances COOPER, 23rd. June 1812 Ickham Kent, Eng. Resided on 400 acres of land, Wormshill, Kent, Eng. Buried 25th May 1865, Enfiled, N.S.W. No, I can not find mention of a Richard Kelcey at St Thomas. The closest names are Catherine Kelsey (d.1898) and William Kelsey (d.1930). I have seen the grave of my grandfather Emanuel Hungerford in say 1939 but when I returned in about the 1960s I could not find it. Is there a plan of the graves? Thomas Hungerford was the son of Emanual and Catherine Hungerford and brother of Rev. Septimus Hungerford, rector of St Thomas’ (1879-95). He was also elected to the NSW Legislative Assembly in 1877. The Catherine Hungerford buried at St Thomas’ is Hungerford’s second wife, it is not his mother. There is a layout of the graves in the book on St Thomas’ – A matter of grave importance. I am looking for the grave of Emanuel Hungerford. The headstone on the same ,level as the grave bore the words ,’Captain take my swrod’. I have been searching for som time for the burial sites for Herman Augustus Herborn and his first wife, Alice Herborn nee Edwards who died about 1915 when my mother was only one.My mother often spoke of this church before she died aged 96 and I would love to find these two sites.They lived in Victoria Square, Ashfield. Herman Augustus Herbon (1873-1949) and his wife Alice Ethel Herborn (1879-1916) are buried at St Thomas. They are both buried in Section K, Grave 17. Thanks in advance for any help. I have just obtained the death certificate for an ancester of mine-James Albert Marvell who died 13 Mar 1918 and was buried 14 Mar 1918 at the C of E Cemetery at Enfield. Is this St Thomas? (he died at the Western Suburbs Cottage Hospital at Enfield). Is any one able to check if he was buried at St Thomas and if so are there any grave/plot/memorial inscription details (? his wife Martha nee Gardner also buried there). James and Martha Marvell are buried at St Thomas’, in Grave 11, Section 46A. James Marvell died in 1918 aged 50 years. Martha died in 1942 aged 87. I am looking for the grave of John Hutch and his family.I believe John was buried at St Thomas’ in Enfield. He died 2nd October 1915. Are there photos of the graves in St Thomas’? I can find no listing of John Hutch and his family at St Thomas’ Enfield. I am not aware of any photos of graves. Thanks Cathy I have found John Hutch in Rockwood Cemetary. I am still searching though for Edward Albert Knowles D: 20.11.1911 and his wife Clara Elizabeth( Meredith) D: 15.4.1921 and Claras father William Meredith D 4.4.1878. Are there any records for these people in St Thomas’ Cemetary? Edward Albert Knowles is buried at St Thomas’. He died 20 November 1911 at age 67 years and is buried in Grave 5, Section 47A. Clara Knowles died 15/4/1921 at age 73 years and is buried in Grave 4, Section 47A. There is also a Charles Meredith Knowles, died 2/1/1879 at age of 5 months, buried in section 11, grave 21. Amelia Knowles died at 5 weeks, died in 16/6/1888, section 11, grave 21. Henry Knowles, died in 10/10/1915 at age 95 years, buried in Section 47A, Grave 5. Jemina Knowles died at age 80 years on 26/11/1949, buried section 47A, grave 3. Nathanial Henry Knowles, died 14/8/1869 at age of 15 months, Section 20. Susannah Knowles died at age 62 years on 22/6/1870 and is buried Grave 5, Section 47A. William Frederick Knowles died at age 9 on 7/9/1881 and is buried in section 11, grave 21. William Meredith died 3/4/1878 at age 70 years. There is no grave or section recorded. Edward Albert Knowles (1844-1911) is the son of Henry and Susannah Knowles, nee Hopson. He married Clara Elizabeth Knowles (1847-1921), daugher of William Meredith and Sarah Ryan, at St Thomas’ in 1866. Their children included Nathanial, Charles, Edward, William and Amelia, who all died in infancy or childhood. Their other children included Henry, who died in 1915 and Edward Knowles Jnr, who died in 1923. His widow was Jemima Knowles, need Moss, who died in 1949. I am looking for the grave of William Pettit, who died on the 9th September, 1875 and he is Buried in Enfield Cemetery. William and his wife Caroline were living in Druitt Town prior to William’s death. William Pettit is buried at St Thomas’s Enfield. His death is recorded on 19 September 1875 and he died aged 75 years. He was recorded as a labourer of Druitt Town and is buried in Grave 9, Section 11. Caroline Pettit died 4 June 1895 aged 99 and is buried in Grave 8, Section 11. She is recorded as residing in Druitt Town. Thank you Cathy Jones. Regards Colleen. These people are also ancestors of mine. Would love to collaborate information. You are correct. Jemima Minnie Fratus died 29 June 1906, aged 61 years. She is buried in grave 30 section 35 at St Thomas’s Enfield. I called his number +441227721100……and there is a very sad message that Mr DANIS BALL was dead. During our conversations with him in 2010, he had mentioned to me several times that he was a member of this church(ICKHAM) and he mentioned to me that if there was any thing urgent and of family nature I should contact this church. Mr Danis left valuable consignment of business nature (Gold)with me, I’m therefore writing to ask if any of you would be willing to contact me (Telephone: ), so that we ca+256 392967716n arrange how I can hand over this consignment to the church or any member of the deceased’s family . The only person with the last name of Fratus buried at St Thomas’ is Jemima Fratus in 1906. I also checked the Rookwood Cemetery records, as many local residents are likely to be buried at Rookwood, and there is no one of this name in this period either. I’m looking for my dads uncle who is buried at St Thomas cemetry . Arthur Ball died 11 May 1940. He is buried in grave 28A in Section E. There is also an Emily Jane Ball buried at St Thomas’ in 1936 in grave 22 Section A. I don’t know if she is a relative. I will now be able to visit his grave , as I have looked once before but couldn’t find him. Your help is much appreciated & I will have to do some research into Emily Jane Ball to see if she is a relative as well. Attwood Edmond Greenway, he was killed when a truck hit him in Macquarie St.
Is there a son’s name anywhere in the records. According to records, Edmund Attwood Greenway died on 18/11/1927 at age of 67. He is buried in section 48A in grave 43. A Jane Dashwood Greenway is also buried in the same grave. She died at age 42 years on 24/9/1927. There is no othe person with the name Greenway in the records list. Cathy, hoping you can assist me please . . . . Is the grave of my relative Edwin Mewton listed? He was buried 9th August 1934 so died just prior. Also, his wife may be buried there, her name being Louisa (Lydia) Mewton. She died on 23rd December 1915. Edwin Mewon is buried at St Thomas’. He died 5/8/1934 at age 66 years and is buried in Grave 33 Section K. Lydia Mewton is also buried at St Thomas’. Died 23/12/1915 at age 30 and is buried in the same grave as Edwin. An Elizabeth Mewton is also buried at St Thomas. Died 24/9/1920 at age of 75 years. Thank you Cathy, that is very helpful. I’m aware of the Elizabeth Mewton – she was Edwin’s mother, maiden name Birkin. They were originally from Maldon, Vic. Their resting places have been a mystery for many years! I meant to ask – can you provide the plot details for Elizabeth Mewton? We will take time to visit St Thomas’s to see these graves. Also, Elizabeth’s husband, Edwin Mewton has eluded me so I wondered if he was also buried there? He died (possibly in Vic) approx 1879 and there is no Death Record in NSW or Vic BDM’s for him so it is a mystery. There are 3 members of the Mewton Family buried at St Thomas’ – Edwin (d.1934), Elizabeth (d.1920) and Lydia (d.1915). There is no record of the earlier Edwin – it is possible he died in another state or overseas. Elizabeth Mewton is buried in Section K, Grave 34. Hi Cathy Jones, would you mind giving me the grave location at St.Thomas for Attwood Edmund GREENWAY d.1927. Cathy I am looking for Eliza Mills who we think is at St Thomas’s Enfield. Thanks so much Cathy, I really appreciate yountaki t the time to look that info up for me. I am looking for a Harriet (Cooze) Hansard who was buried there (I believe) in 1890. Harriet Hansard is buried at St Thomas’. She is described as a farmer’s widow of Burwood. She died on 5/10/1890 at age of 87 years. She is buried in grave 29 in Section 46. Alice Nicholls of Petersham is buried at St Thomas’. She died 11/2/1918 at age of 85 years. She is buried in Grave 3, Section 44. I am the great great ganddaughter of Eliza Mill who we have been told is at St Thomes Church. Are you able to help as I could not find her when I went to look. There is an Eliza Mill buried at St Thomas’. The date of death is 16/7/1913 and was 68 at the time of date of death. She is described in notes as from Wallsend. The grave is located in Section 27, Grave 15. The funeral of the late Staff Sergeant Richard MacNamara took place on 13 June, 1913 at St Thomas’ Church of England Cemetery, Enfield. If he was also buried at that place, I’d appreciate a grave location. I’m currently studying a unit of History on death, dying and cemeteries and would like to use the St Thomas Enfield cemetery for my research. Could you let me know if there are many Christian denominations in the cemetery or only Church of England?? As far as I am aware, it would be Anglican but you would need to enquire directly to the Church to confirm. HI there, I am searching for Sarah Pike (nee Buckley) who I believe is buried at Saint Thomas Anglican Church. Can anyone confirm this? By all means email me at raquelann1971 at yahoo dot com dot au.